This Sears Phoenix differs in many respects from the catalog illustration. The home in Norwood Park is in brick. The Phoenix as delivered had a facade of Stonekote, which was a ready-to-use cement plaster very commonly used from 1910-1920. Sears had a deal with the Garden City Sand Company of Chicago to provide the Stonekote to its customers. The brick facade was added on the house later. Additionally, the porch was enclosed and the front door was relocated to the side. There is an addition on the rear. The roof pitch and width is off as well. Sears did not sell the Phoenix with lumber pre-cut at the factory. Sears sold the lumber "not cut or fitted". They often did this for the more elaborate homes in an effort to keep the prices down . The Sears Phoenix was offered for sale between 1909 and 1918. 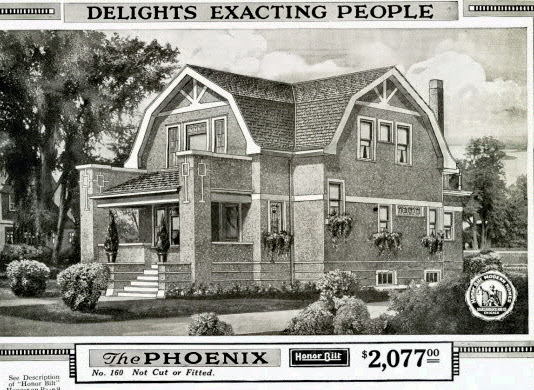 This particular Phoenix was listed as a testimonial in the 1916 Modern Homes catalog. So we can narrow down the date of construction to 1909-1915. In those years the Phoenix was called Modern Home No. 160, or even catchier, the C160. I don't know who the original owners were. In 1920, John F. O'Brien lived there with his wife Adah and their seven (!) children. John was a police sergeant and Adah taught school. By 1935 they had moved out of the house on Hobart and were living in separate residences. In April 1938, Dr. Edward V. Boarini and his wife Edelle moved in, along with their six children. They lived in the Phoenix until 1956. White & Christie were the architects of the Phoenix. They designed many notable houses in Oak Park and Chicago. There is a Google Site with some awesome interior photos of a Sears Phoenix. "When we moved in there was not a fireplace but my Father had one built in 1941. It was between the windows on the East side of the house just opposite the stairway in the hall. I have vivid memories of the fireplace going in because my Mother was so particular about the tiles with flowers she picked out to frame the fireplace with the white mantle and a black marble hearth. We moved to the house on Hobart from a five-room flat so we were thrilled with the size of the bathroom which had a large square green bathtub with a seat on each side. It was different but also a pain to clean. "I loved that house and my husband and I bought it from my parents in 1956. We sold it in 1962 when we moved to McHenry." 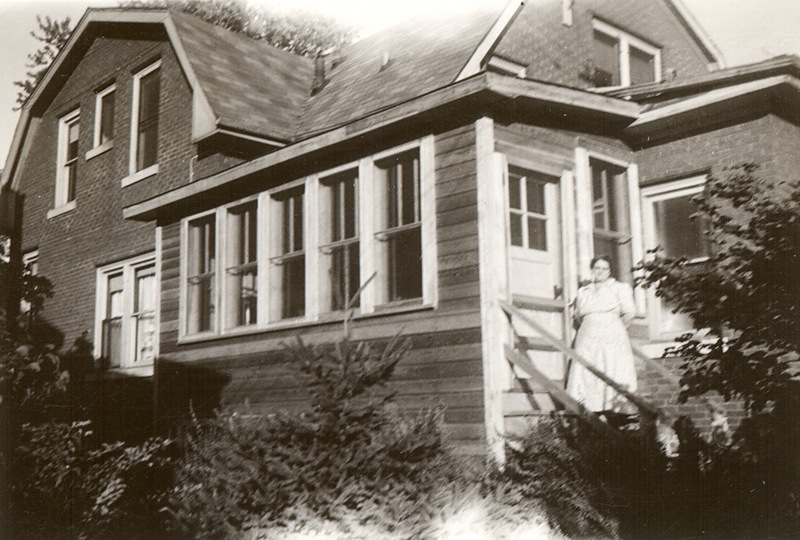 Edelle Boarini in the back of the house, about 1941. Photo courtesy of Mary Idstein. The house about 1962. Photo courtesy of Mary Idstein. The real estate listing sheet from 1962. They underestimated the year of construction! Photo courtesy of Mary Idstein. Are you getting the biographical information from the Census records? Yes, and I also use newspapers, telephone directories, city directories. Welcome to Sears Homes of Chicagoland! Do you love old homes? Then come on in! This site features houses ordered from mail-order catalogs--Sears Roebuck, Montgomery Ward, Harris Homes, and others. These kit homes are undiscovered treasures that are hidden in plain sight. If you know of a Sears home or other catalog kit home, please email me! If You Like This Site, Check These Out! © Lara Solonickne and Sears Homes of Chicagoland, 2019. Unauthorized use or duplication of this material without express and written permission from this blog’s owner is strictly prohibited. Limited excerpts and links may be used, provided that full and clear credit is given to Lara Solonickne and Sears Homes of Chicagoland with appropriate and specific direction to the original content. 2019. Theme images by Airyelf. Powered by Blogger.